Furniture in black (or almost black) is common for the modern design projects. But if you talk about the historical roots of black furniture, it was most widely used in the interiors of the imperial palaces located in China. Today any homeowner can create any design at home – from the imperial bedroom to the minimalist living room with a sofa in the spacious room. Black furniture in a wide range of models is presented in the shops. It remains only to create an image of the future interior – how to combine a dark room decorated with furnishings, what decor to choose and whether to dilute the design with bright accents? 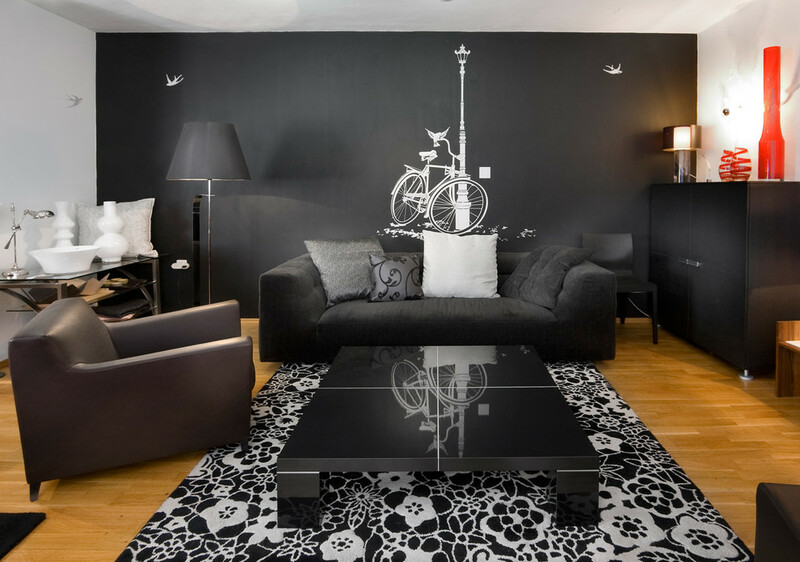 We will try to understand the nuances of using black furniture in modern rooms with different functional purpose. The most popular variant of integration of black color in the living room interior by means of the furniture is the use of dark upholstery. The black leather furniture looks luxuriously and is practical in terms of the operating soft option to arrange soft living room recreation area. Typically, such furniture is installed in a room with a light, moreover snowy, finish. To support the “black theme” in the interior of the original model, you can use lighting fixtures of similar color. There is enough of such models in modern stores. 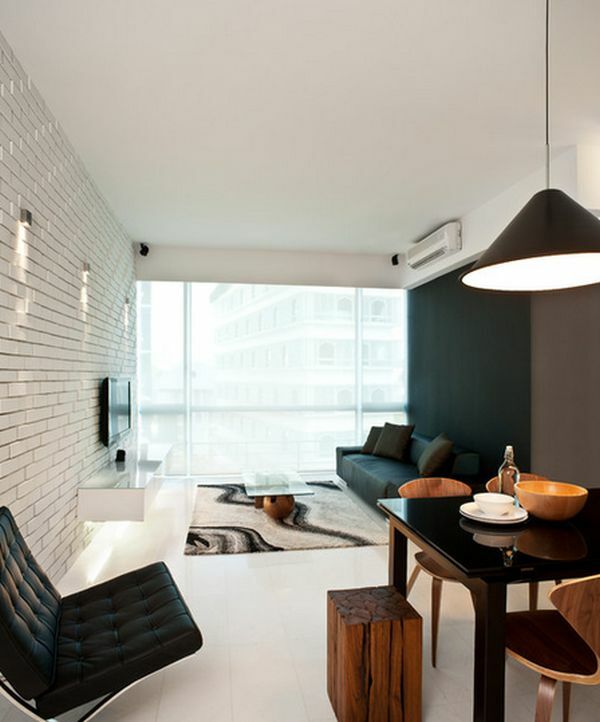 Monochrome contrast interior of living has become a classic of the genre for modern homes. Using only two colors for the decoration of the room, slightly diluted with gloss of mirror and glass surfaces, looks modern, dynamic and original. Many designers consider the black color suitable for modern styles of interior decoration, Art Deco, Minimalism or Asian country. But the classic decorated interior will look too pretentious with black furniture. But what prevents us to use a mix of modern design and traditional furniture model? The resulting image can not be called trivial or boring for sure. 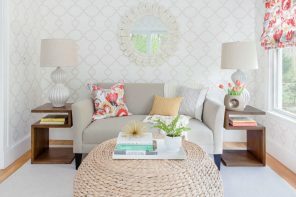 Not be every homeowner can dare to finish all the walls of the living room in a dark color, and the space of the room must allow such liberties. But to use wall black surface as accent is much easier. In combination with white trim for the rest of the walls and support in the form of black-white print, the resulting image will be very harmonious, balanced. 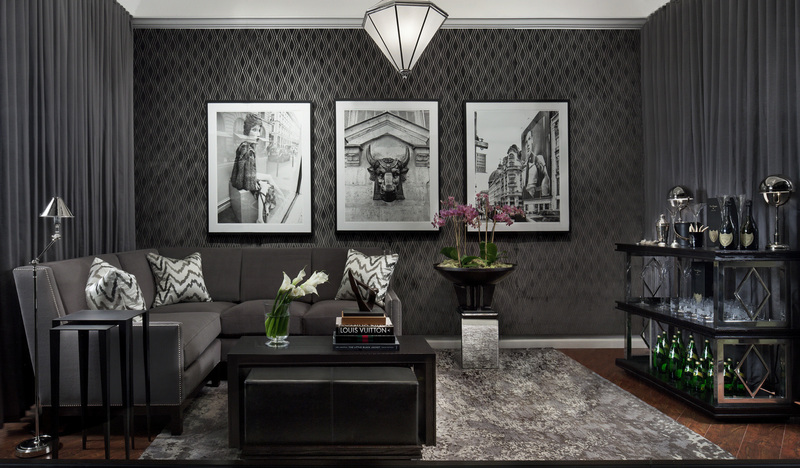 Different shades of gray can act as the mediator between black and white in the living room interior. Upholstered furniture with black covering will look contrasting in the living room decorated with white and gray. To create a harmonious interior is better to duplicate these tones in additional furnishings, carpeting, curtains on the windows or decor. The original idea for the living room is the use of embossed black wallpaper and velvet upholstery of chairs with the same pattern. Of course, there must be a serious dilution of light spots for such an extensive use of black color in the interior design. Use white trimming for windows and a fireplace, mirrors, light carpeting. If the idea of ​​placing the black furniture in the living room of similar color seems strange to you, take a look at the next design project. 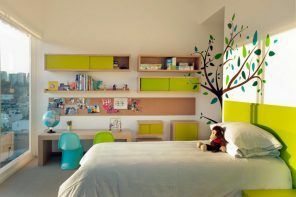 The room does not look oppressive, bleak and it is due to the bright wall decor and skillful highlighting of the most winning interior elements. The use of a combination of black modules furniture with objects of more colorful colors can be offered for those people who are not ready for such radical decisions for decoration of the living room. Even within a single ensemble of furniture you can harmoniously combine two colors. Especially considering that it is easy to choose the company for the black. Upholstered furniture in black is perfect to shade bright interior elements. It can be furniture, decoration items, original light fixtures or colorful textiles. Many homeowners do not risk to use upholstered furniture with black leather upholstery, because it is associated with office style, especially if the pieces of furniture have steel elements. 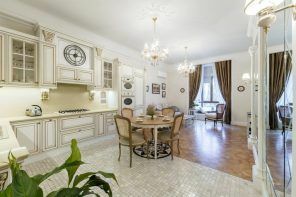 But if such furnishings is located in the room with not monochrome walls, but decorated with brightly colored wallpaper with the original pattern, there is no hint on the design office will remain. Again, the association with the design of office space avoids the owners of country houses from using the black leather furniture for the living arrangements. But modern design projects show that it can be done very effectively. The interior of the farmhouse can harmoniously blend wooden surface motifs of rural life with ultra-modern models of upholstered furniture. The Contemporary style often uses a combination of pure white finish and black décor. The black window frames with black sofa and black upholstery with matching bookcase will look unbelievably harmonious as a composition. Another example of usage of black furniture in the living room is the storage systems of various modifications. After all, family room is not just a relaxation area for a households and their guests, but also an excellent opportunity to store various items needed for family – from clothing to pottery. Built-in storage of black color, which seemingly surrounding the fireplace, organically fits only in a spacious room with large windows – such monolithic structure needs support of the light decoration. If a monolithic storage system in the wall (and if more it`s black) is too cardinal design course for you, so try to use open shelves for storing books and other little things in the living room. 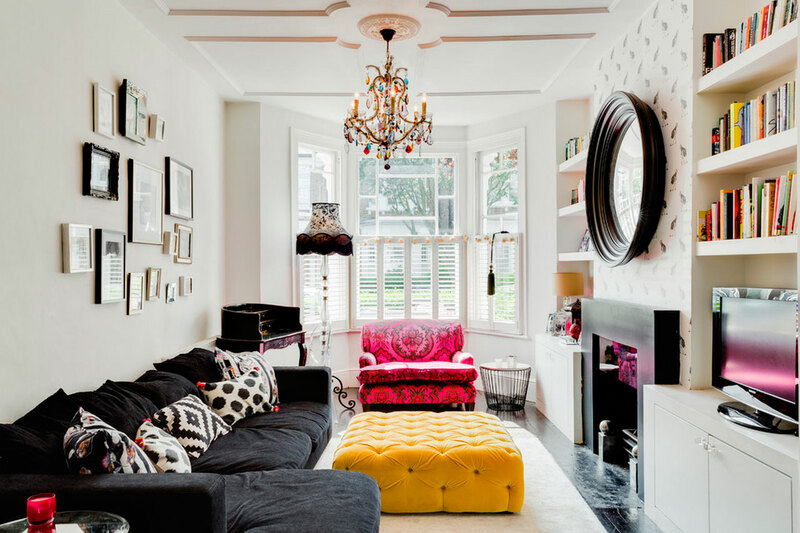 Located along the both sides of the fireplace (in the design of which is also used black) shelves bring symmetry to the room, not to mention the functional aspect. Black and white bedroom interior looks stylish and modern. The most common version of the combining of these two contrasting colors is black furniture against the white trims` background. However, many contemporary designers and homeowners consider this option rather boring, and there are the black and white ornament and original paint on the textiles, carpeting and a mix of dark and light in execution of lighting fixtures and decorative elements. 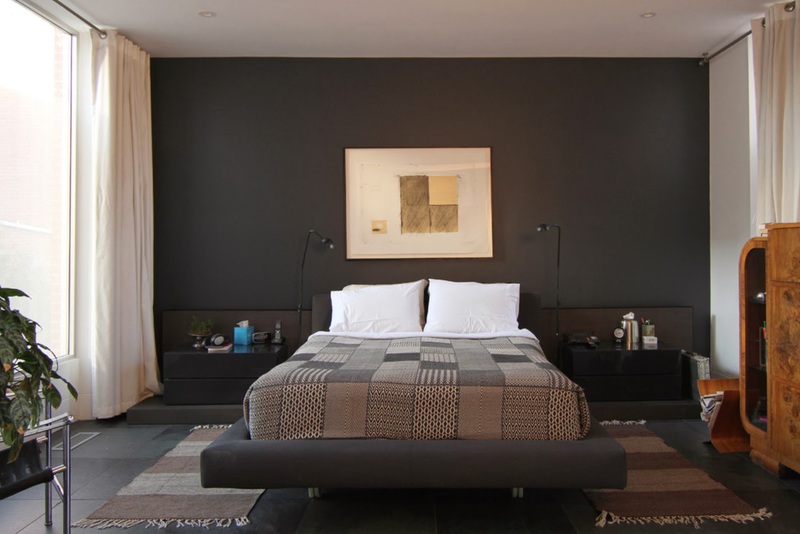 The bedroom, where all furnishings and even textile design is represented in black is uncommon. 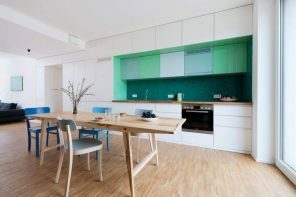 But the interior decoration in a modern, minimalist style is very suitable. It is only necessary to consider that such a design would look organically in the spacious room where the surface will not be “put pressure” on the home dwellers psychologically. To do this, it is important to take care of the lighting system at several levels – not to content yourself only with the central chandelier and a night light, but actively use the built-in backlight. Yet another alternative for designing of “black bedroom” is opposite to Minimalism style – the room of collector. Unusual design course, to apply black tone contrary to the common use of white walls to form the background of paintings, photos and other collectibles. 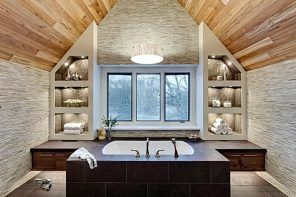 To do this not only for the walls and floor, but also for the ceiling is really bold decision. 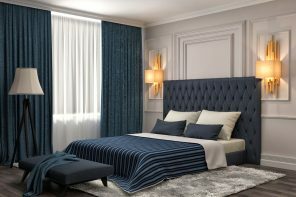 Absolutely black bedroom with textile wall coverings with a long nap is not only a unique design, but also a great option to increase sound insulation properties of the room. It seems that in a black room furniture should simply disappear in the space, but because of the difference in surface texture furniture objects stand out against the general background . No one will argue with the fact that the main piece of furniture in the bedroom is the bed. If this focal center of the room is made effectively, practically the whole area`s image would be developed in accordance with its design. High headboard, fitted by a beautiful textured leather, will create intrigue in the design of the room for sleep and rest. Today in the shops of the ready-made solutions for the bedroom it is not difficult to find an option in black. Wenge furniture set consisting of a bed and bedside tables, cabinet or high chest, looks luxuriously in the room with a light finish. For bringing originality to the design of the room for sleep and rest, you can use wallpaper with black and white pattern for decoration of the accent wall. 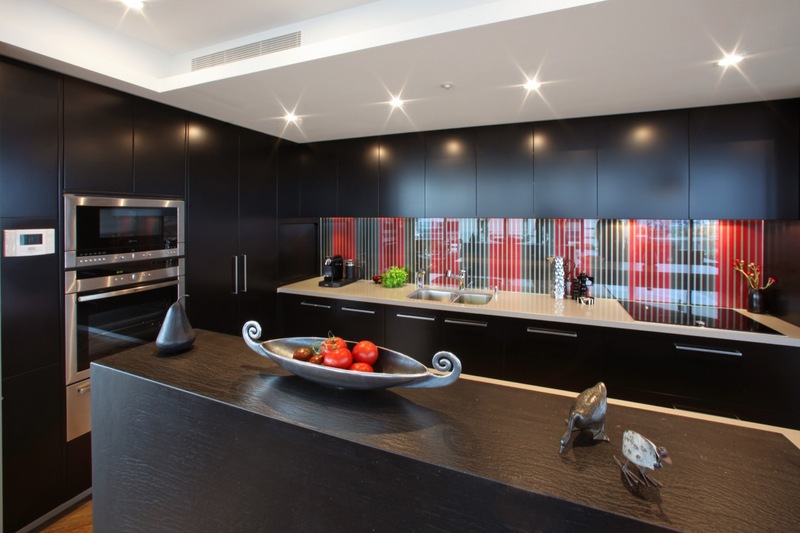 Black color can be easily found in embedded appliances of the modern kitchens` design projects, but the execution of a large suite of furniture in dark colors is a rare highlight of the interior. After all, kitchen is a room with high level of pollution, humidity, temperature drops etc. and it is not easy to take care of a black surface. Even traces of water droplets are visible on it. But the extra time required to clean the kitchen is nothing compared to the modern, original way of kitchen space. Huge black kitchen set, built from floor to ceiling, looks massive and requires dilution with lighter spots. 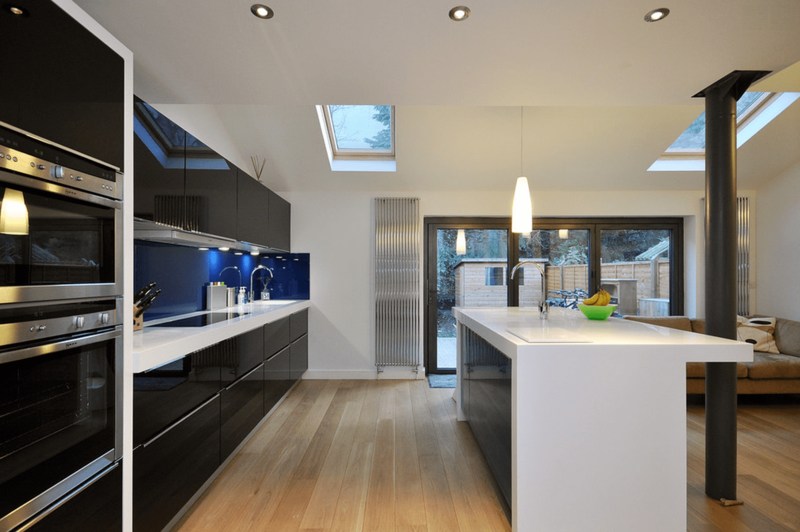 It can be a wooden countertop, white kitchen island or shine of the stainless steel appliances. Modern dining room with black furniture can be simple and concise – severe forms, practical models of furniture, contrasting combinations. The basis of the concept design of the premises is a comfort and convenience for households and their guests, and the alternation of black and white surface is perfect for democratic interior. And the dining room of the our days can be a mix of original stylistic interweaving. Modern finishes using the most advanced materials combined with classical-style furniture looks very impressive. It adds a dynamic image of the dining room and originality of the widespread use of black and white combinations, slightly diluted steel shine and mirror surfaces. The easiest way to diversify a trivial design of the dining room is use of black designer`s chairs of various modifications for a complete dining group with the most ordinary table for meals. Graceful shapes, flowing lines and original designs bring patina of modernity and exclusivity to the image of the dining room. How to integrate the black color in the design of the bathroom with the help of furniture? Of course, the use of storage. 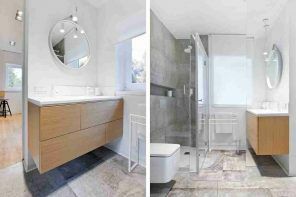 Obviously, the furniture made of wood or MDF is impractical to use in the bathroom because of the high humidity, but modern designers find out the solution. They use water-repellent PVC film that can mimic the appearance of any surface. Black and white bathroom interior looks modern, dynamic, intriguing. Especially, when it is not just black and white combination of matte or glossy tiles is used in the decoration, but we can also meet the spectacular imitation of natural stone, such as marble.